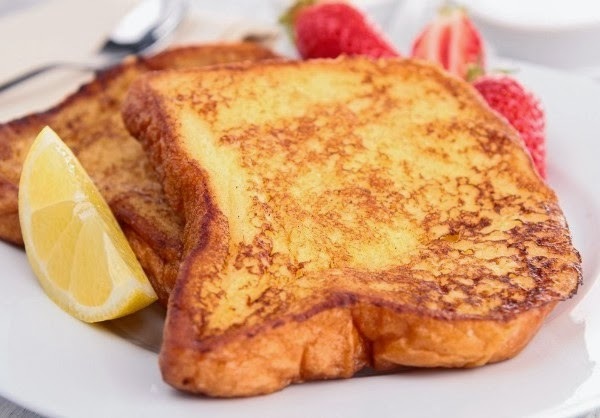 Everyone seems to have his or her own idea about which type of bread makes the best French toast. I prefer French bread sliced on the diagonal, but whole wheat bread is a close second. Both are delicious topped with warm maple syrup. 1. Beat the eggs thoroughly in a large bowl. Add the milk, sugar, orange rind, cinnamon, and brandy, and mix well. Pour into a shallow dish like a pie plate if your bowl doesn't have a good flat bottom. 2. Add a few slices of bread and let soak, turning occasionally, for at least 5 minutes if it’s French bread, or 2 minutes if it’s regular sliced bread. 3. Put a little butter in a large skillet and heat over medium heat until hot. It should sizzle when a drop of water is flicked on it. Fry the bread on both sides until golden brown and piping hot.